We may, or may not, be going to get a longer runway, but it seems we are going to be getting a largish hotel to stay in, next to jet city. I’m honestly not sure how I feel about airport hotels – having only once stayed in one when I got bumped off a flight in the USA and we got bussed to an anonymous block in the middle of nowheresville. The city itself was too far away – we then got woken up and bussed back at 5am or something ridiculous like that. Overall, not a pleasant experience, but the complimentary contents of the minibar helped ease the pain. But Wellington is a small city, with a vibrant centre not very far away at all. Anybody in their right mind would surely want to go into the centre of town, and stay in a hotel there, surely, rather than anchor themselves in a block in Miramar next to a rowdy airport? Do we bump that many people off flights? Do we have that many overnight delays? If you came to Wellington and stayed in the Airport hotel, would you be happy paying the cab fare back to your hotel at night, as there is no public transport late in the evening? Unless, of course, you were a minion at Weta. The big Hollywood, Bollywood hotshots that fly in to consult with Sir Peter and Sir Richard and Sir Fran absolutely love the fact that our airport is so close to the Park Road offices (except when they are shooting, of course), but I’m betting that none of them will be staying at the Airport lodge. No, if they are not holidaying deep in the Wairarapa in the faux hobbit theme park, then they will be safely ensconced in one of Jacksonville’s many sea-side upmarket baches that dot the perimeter of the eastern bays. But the airport could indeed be useful for short stays (short actors?) although, with 134 beds, it sounds a little on the hopeful side. Still, I’m sure they have done their sums and the business case stacks up. The newspaper report, as usual, tells us nothing about the designers. Originally it was going to be by Archaus (a few years back) but I’m not sure if it still is – perhaps one of you could tell me? The design is fairly…. Average, and that’s a disappointment, although unsurprising since Lloyd Morison died. He was the one who drove the madness that created the gloriously crazy feature that is The Rock, and I’m reasonably sure that he would have wanted nothing but excellence for an associated hotel too. 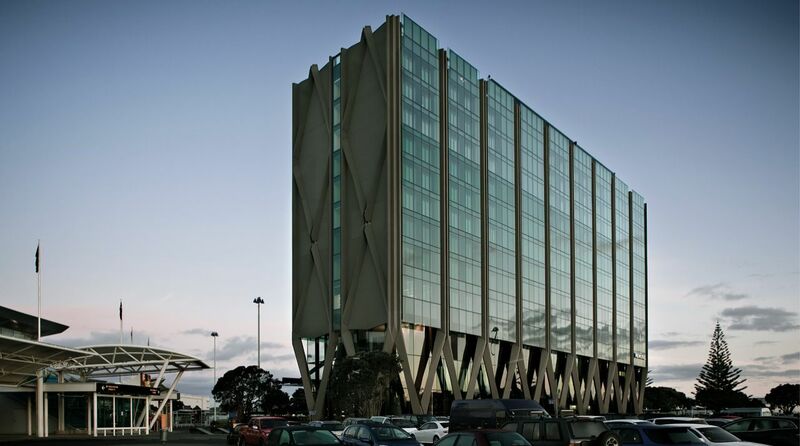 It’s not like hotels have to be boring – the airport hotel in Auckland, run by Novotel and designed by WAM, seems to be a ravishing tall beautiful sculptural structure on long criss-crossed legs, like a slightly knock-kneed supermodel working the catwalk besides the detritus of cliches that is Auckland Airport. But here we seem to have inherited her fat younger cousin in some old hand-me-downs, with a mixture of horizontal stripey spandrels, and a couple of big V signs to the golf club. One of the nice things about the Wild at Heart Wellington Airport, situated in the Middle of Middle Earth (according to its name on the air side of the terminal), is the closeness and the user friendliness of the terminal. It doesn’t cost that much to get out to, it’s not that far away, and the architecture is a mixture of CCM’s low sleek box, and Studio Pacific’s mad copper-covered rock pool. 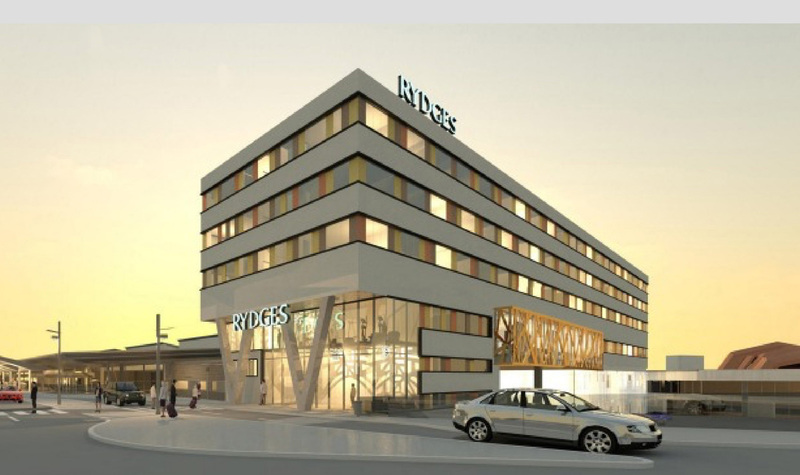 But now the visitor is to be met by a lumpen block of a hotel at the north of the site, and also, apparently, a multi-storey carpark, although I’m not sure where that will go. Down the back, near the sheds, at the base of the Moa Point hill, I would have thought, but apparently I’m wrong. Given the airport’s propensity for advertising, no doubt the side of the car park will become a venue for massive advertising hoardings as well. Personally, I think they are doing it all wrong. 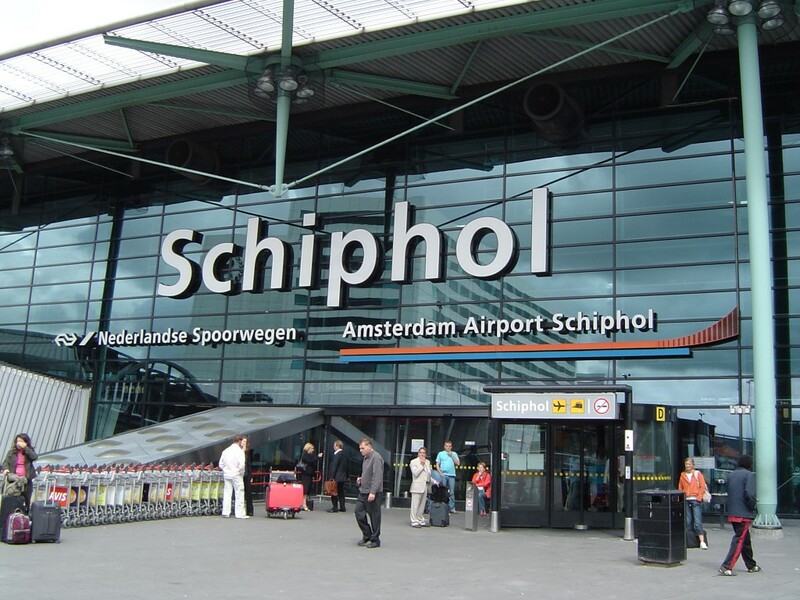 My favourite airport in the entire world is the wonderful Schiphol in the Netherlands, where (as far as I know) there is next to no car parking at all. Instead, trains arrive from all over Holland and you simply step of the train onto the platform and then glide up a travelator directly to the check-in counter. Bliss. Incredibly smooth. No need for a taxi or private car at all. 15 minutes by train takes you to Amsterdam, Rotterdam, Den Haag or Leiden without a worry in the world, at less cost than an hour in the Wellington airport carpark. We are, of course, a much smaller city and we don’t have the draw of the whole of Holland as They do, but we do seem to have this obsession with cars, and obscene high costs of parking there. What would be best is for an extension of the proposed Rapid Transit system to the airport, whether by bus or by rail, and that a simple loop route be introduced and safeguarded for PT to be able to drop off and pick up right by the door. Then there won’t be the need for such ugly things as parking buildings, or airport hotels. Now that would be positive thinking. With early morning flights to Australia and beyond, it would be rather convenient to stay at the airport. It’s also another option for visiting friends & family out in the eastern suburbs. Or to arrive late, stay, pick up the rental car, and head north to the delights of the Wairarapa [\snigger]. While the memory of 36 hours of budget airline limbo still causes a friend of mine to mutter darkly about “the Schiphol of the Universe”, I don’t think parking the car was part of the problem. In Rongotai’s old fibro shed days, when admittedly I was just a visitor, I recall the famous queue for taxis, with all kinds of instant friendships struck in the interests of a split fare to the Terrace and a fair chance of spotting a cabinet minister in a damp raincoat. On the way out of town, there was the NAC Downtown Terminal (now the School of Architecture Red Shed) where you could check in, hand over your bags and catch the bus out east – possibly for free. I don’t remember anybody parking at the airport for any length of time at all to be honest. Wellington Airport is virtually CBD by Auckland standards – let alone Dutch ones. It attracts more taxis than Happy Valley has seagulls and still apparently there’s sufficient demand to double and redouble the car park capacity. What’s wrong with us? Good to see that no architects were inconvenienced in the commission of this ‘artist’s impression’…? Here we have what looks like an Audi, prominently exiting the carpark, while in the distance far off to the left, there is possibly a bus waiting for passengers. Or maybe its a stray golf-cart. No planes in the sky. A walk-in entry facing east between the big Vs, with passengers possibly getting dropped off by the black RangeRover. The street lights nearby appear to have been stolen from the Wellington Waterfront, for some unknown reason. It’s important to pay attention to details. NZTA presented to the world a rendering that implied that people would sunbathe in the middle of Kent Tce under the bypass flyover, which seems a little unlikely. This render similarly represents several unresolved details, and has air-brushed the messy reality of a modern airport out of the picture. Levi – it’s not a bus over on the left. It’s a little red sports car waiting to pick up someone. Not a sign of a taxi in sight though, perhaps that’s considered too distasteful to photoshop in a queue of 500 taxis waiting for an influx of passengers off the non-existent planes. m-d – I was going to say that it would be easy enough to find out who the architects were, by just going down to the Council to inspect the Resource Consent drawings, but then I remembered: the airport doesn’t need to ask for RC for its buildings, as long as they are part of “airport related business”. So if no one owns up, we won’t know until they submit for Building Consent. Curious that no one has put their hand up though. Aren’t they proud of their work? I’m pretty sure that it’s Archaus.